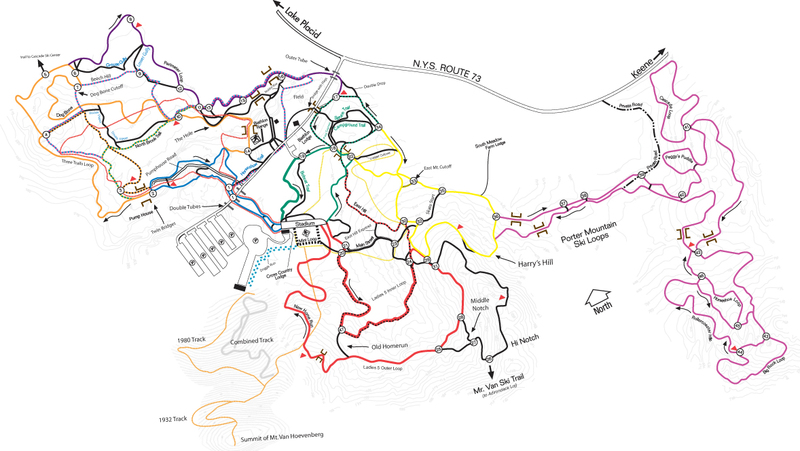 While there are 15 marked loops at Mount van Hoevenberg, there are another 10-15 connector trails that provide for nearly innumerable skiing options. For example: the Ladies’ 5 k loop was the women’s 5k relay loop during the 1980 Olympics. If that’s not enough thrills and chills, detour up the Hi-Notch trail, which was part of the men’s relay and men’s 15 k events. Mount van Hoevenberg connects with Cascade Ski Center off the Three Trails Loop (interconnect pass required) and with the Mr. Van back country ski trail off of Hi-Notch; Mr. Van will take you towards Adirondak Loj. Backcountry gear required if you want to make that trip. Note that the major trails at Mt van Ho – East Mountain, Brookside, Porter, Ladies 5 etc are all one-way trails. Please respect the one-way skiing direction. The cross-country side of the trail system has the steeper climbs and descents. While the biathlon side doesn’t have as much elevation change, it’s just as technically demanding.